How can I pay my bills after a motorcycle crash if I'm unable to work? Motorcycle accidents don't just endanger a person's physical wellbeing—they can also deal a significant blow to a victim's financial situation. This is especially true if the biker's injuries are serious, require extensive medical treatment, and prevent them from working. 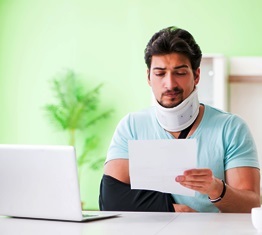 The situation can lead to significant stress for people who are often consumed with worry about how they'll pay their bills while injured and out of work. If negligence on the part of another person or entity caused the crash, injured individuals may be entitled to compensation for medical expenses, lost wages, and other damages. Unfortunately, a settlement or financial award that comes weeks, months, or even years down the line won't help them pay the bills currently piling up on the kitchen table. There are numerous ways that Georgia motorcycle accident victims can handle bills in the interim. Billing their health insurance company and using medical payments coverage as an additional layer of protection. Contacting an attorney to file a personal injury lawsuit and begin negotiations. These types of attorneys work on contingency, meaning they're paid out of the victim's financial award, rather than up front. Working with medical providers to defer payment until the case is resolved. Medical expenses are often the first items reimbursed out of a settlement. Accessing personal savings, borrowing from family, or taking out a loan. These options can be particularly helpful for paying household bills such as rent, utilities, and food. After a Georgia motorcycle accident, many people often struggle to regain both physical and financial health. However, a motorcycle crash doesn't have to put you in dire financial straits. If you were hurt in an Atlanta-area motorcycle wreck that wasn't your fault, the experienced personal injury attorneys with Van Sant Law will explain your legal rights, discuss options for paying bills, and help you determine what to do next. Contact us today to schedule an appointment for a free initial consultation to discuss your case with a member of our legal team.